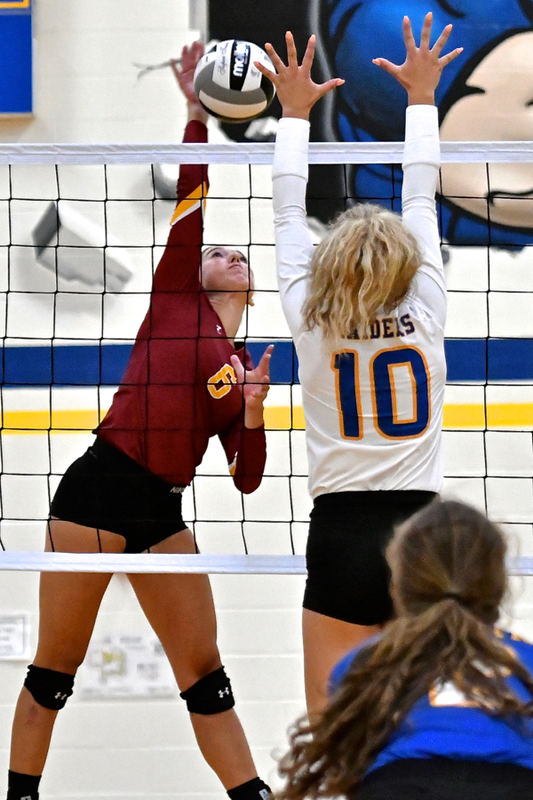 Russia came close to validating its pre-season volleyball hype, taking Division IV champion New Bremen to the fifth set before falling to the late-charging Cardinals. Russia – It wasn’t a thing of beauty. Openers often aren’t. There were mistakes and mishits aplenty. What coulda’ been wasn’t, for either team. In maritime terms, neither could find their sea legs. But still, the Russia Raiders (1-1) came within a five-minute span in the fifth set of dropping the defending Division IV champion New Bremen Cardinals Tuesday night in front of a packed gym, before Bremen finally seized the momentum (down 3-0 to start the fifth) to go on and take the match, 24-26, 25-17, 25-19, 11-25, and 15-11. New Bremen’s Macy Puthoff digs one off the deck. Russia had a match under its belt, having beaten Covington in their opener on Saturday. But for Diana Kramer’s Cardinals it turned out to be a nightmarish debut with hitting errors, missed serves, and discombobulation. And still…they won! 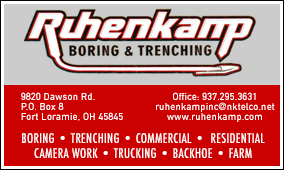 From the get-go…Russia came out aggressively and had Bremen on their heels, out of synch, maintaining a 3-point lead throughout the bulk of the first set before Bremen came back to tie at 24-24. But after coming that far, with the game in their grasp, the Cardinals committed errors on back-to-back points to give Russia the 26-24 win. Bremen rebounded in the second to cruise (?) to a 25-17 win; and maintained a bit of that momentum to take a two-one set lead with with a 25-19 win in the third. But in the fourth Russia came out swinging, Laurissa Poling and Ashley Scott scoring while the Raiders defensively turned away most of Bremen’s bids for points. They were tough at the net, Poling with nine blocks for the game. Russia built the lead to 16-9, then 18-9, before ultimately taking the set and the obvious momentum with a 25-11 rout. Russia’s Ashley Scott reaches to keep a point alive in the fourth set. And in the deciding fifth set it looked like they would. New Bremen suddenly looked tired at the end of the fourth, and that carried over to the start of the fifth. Russia came out on fire, running off three consecutive impressive points to take a 3-0 advantage. But for whatever reason…they stalled, and allowed New Bremen to go on an 8-2 point run of their own, recapturing the momentum – taking the wind out of the Raiders’ sails. After falling behind 3-0, they went up 8-5, then 10-7, before Russia found one last gasp of effort to close to within three at 14-11. But New Bremen easily scored the 15th point on the ensuing serve to take the match. 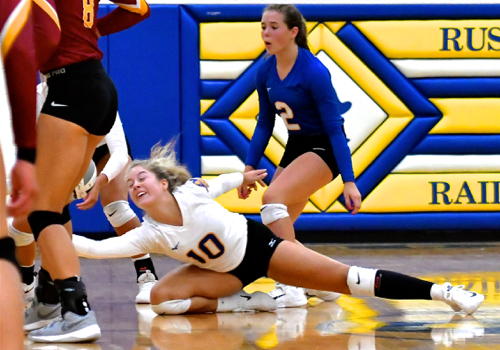 For New Bremen, they had 32 hitting errors, 11 missed serves, and got aced 11 times, allowing for Kramer’s frustration. And statistically, Claire Pape and Taylor Paul led them with 11 kills each. Josie Reinhart added 10 and Macy Puthoff had 9. Russia’s Lurissa Poling had 11 kills and 9 blocks for the Raiders. For Russia, Laurissa Poling had 12 kills to go with her 9 blocks, while teammate Ashley Scott had 10 kills and three blocks. 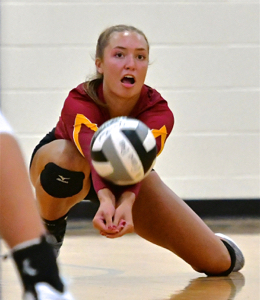 “Hopefully we see them again at the end of the year,” said Russia coach Aaron Watkins, acknowledging that while New Bremen lost Paige Jones from last year’s championship squad, they’re not to be taken lightly or considered in rebuild mode. 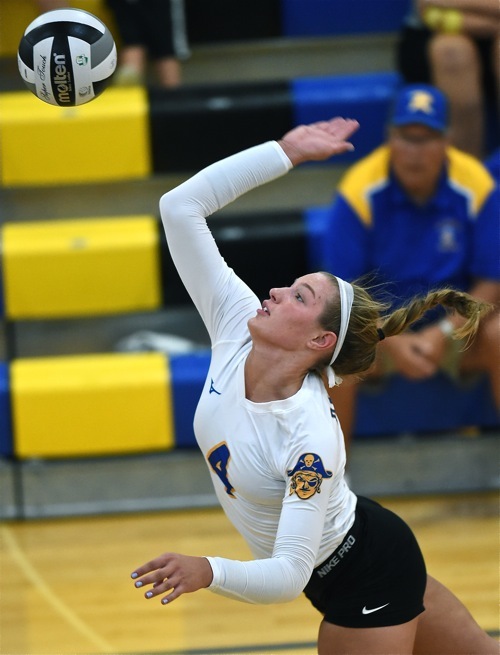 “We felt pretty good when we were up 3-0 in the fifth set,” said Watkins. “We made a lot of mistakes, and I thought we did a nice job in each set of coming out of that – overcoming. We seemed to have a low spot in each set and we came out of it well. And in truth, Aaron Watkins could smile when reminded that he probably came within five minutes of actually beating the state champions in their opening game. And the good news for Diana Kramer, who finally smiled when reminded…when you have all but two back from a state championship team, well, you know you’re going to get better. Russia’s Kendall Monnin goes to the floor to save a point for the Raiders.